Vintage has always been a feature in all the homes I’ve lived in throughout my 31 years. From my Nana’s chintzy teaspoon collection, you know the ones that feature awful image quality photographs of the Queen marking a celebratory occasion, yep those. To an original Victorian call box bell, that hung eerily above the kitchen door in my childhood home. Even throughout the various student dives I lived in during my early 20s where me and my friends liked to sip cheap wine from mismatched china whilst wearing our favourite charity-shop-find tea dresses and Jane Shilton shoes. When Alex and I purchased our first home, our first joint purchase was a teak vintage bar trolley, hilariously this came before anything practical like a sofa, bed or kettle ! And now after 12 years of living independently and figuring out my own taste and style, vintage is still a big part of my wardrobe and home. 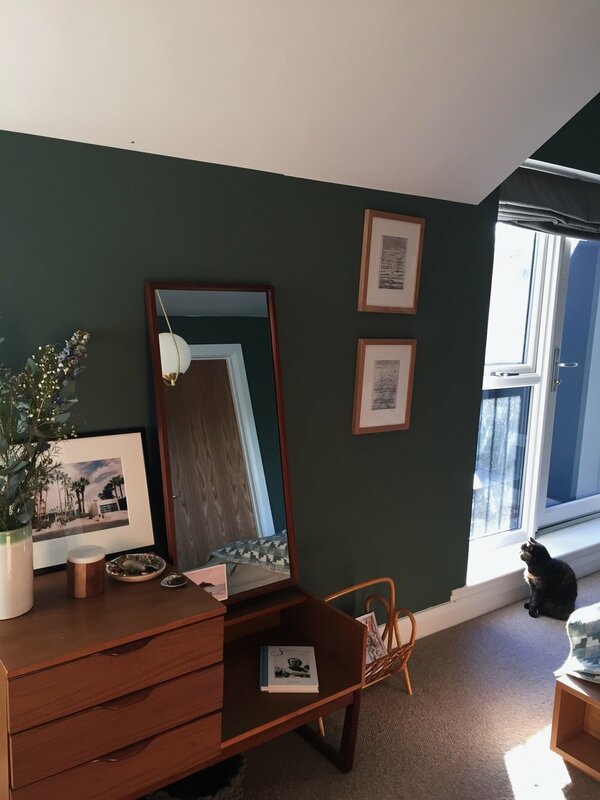 In this blog post, I’m mostly going to be focusing on vintage furniture and interiors by sharing some helpful tips I’ve learnt whilst sourcing pieces over the last decade. Shopping for vintage can be extremely overwhelming, time consuming and unnecessarily expensive, hopefully this simple guide maybe useful for introducing some character into you home. If you are purchasing online, read descriptions very carefully. Look out for items described as ‘gently used’ or ‘minimum signs of use’, especially when it coms to buying sofas and chairs. If an item is described as showing ‘minor signs of wear and tear’, check to see if these problems are going to affect the use of the piece. For example, drawers that do not slide out easily from a sideboard cannot be fixed and will probably end up breaking in a short time period if you constantly have to force them open and shut. Also look out for signs of cracks in plastic furniture, once this cracks completely it won’t be able to be repaired. When it comes to wooden items check for signs of wood worm, water damage and badly glued repairs, all of these things are very difficult to correct or can be costly. Keep your eyes peeled for features that show craftsmanship such as well-finished corners and edges, this will be a good indicator as to whether it is worth price the seller is advertising. Also a piece made from real wood not veneered wood, will be more worthy of a higher price point. If you are shopping for vintage online, try narrowing your search by being more specific about what you are looking for. If you can, include the era, designer, specific edition (if known) colour, material and location. For example if you have an exact idea for what you are looking for enter as much detailed information as possible such as 'Robin Day, 50’s 675 Case Chair, Black Leather, Walnut, Manchester'. If you aren’t sure about specific details but know for instance you are wanting to find a vintage side board, try searching 'Danish, Teak, 50’s, Mid Century, Side Board' and then your location, this will bring up more options for you to consider and compare. I personally prefer to shop this way on Etsy, Ebay and Preloved rather than use the filters provided as I find my personal specifics usually return what I’m looking for in less time. Image: Robin Day 675 Chair pictured in our old bedroom. Sourced at Alty Market. If buying vintage online, look out for product descriptions that are super detailed with factual information about the piece (Era, Brand or Designer, Year it was made) as well as listing any faults or markings. A variety of images taken from (different angles, close ups, styled shots) are a good sign you are purchasing from a reputable, trustworthy seller. Research iconic designers, brands and companies to get a better grasp of how much you should be paying for an item. Just because something is classed as vintage it doesn’t necessarily mean it is good quality or worth the expense. For example, brands such as Ercol and G-Plan were mass-produced furniture brands, sold largely in high-street department stores from the 1950’s onwards. Even though they weren’t considered to be unusual or iconic at the time, over half a century later they have earned a certain ‘original status’ and have gone up in value. However compared to more high-end, exclusive designers such as George Nelson and Eames, there should be an distinct difference in the price points when sourcing vintage originals. From my own experience, buyers should expect to pay around £350-£400 for a second-hand Ercol ‘original easy chair’ that has been reupholstered and restored and for an original Eames leather reclining chair, somewhere between £2000 - £4000 depending on the condition. Also measure the space accurately that you are hoping to fill with a piece of vintage furniture. Unlike vintage clothing that always seems to come up small, furniture seems to be the opposite and be larger than expected. When sourcing vintage there are variety of different places you can shop depending on how much time you have and how much money you want to spend. For budget friendly options try house clearance dealers and auction houses but do bare in mind these pieces are likely to need restoration. If you are planning to do the work yourself this is a really good option, if not try and get a few quotes from upholsters or craftsmen before you take the plunge, it might not be so much of a bargain as you first think. Scour Antiques Mills, Flea Markets and Car Boot Sales, you’re likely to pay a higher price point as you aren’t cutting out the middleman (i.e. the vintage seller) but the over all condition is likely to be better. Visit specialist vintage shops and sellers, items will come at a higher price point but they have done most of the hard work for you, restoration, time and effort of sourcing and usually will have displayed their items in an imaginative setting that is easy to browse. Image: Ercol Windsor chair restored + upholstered by Reloved Upholstery. Gibson + Gibson (was Carafe Homewares), online + various Manchester markets, best for affordable ceramics, glassware + decorative objects. Pear Mill, Stockport, best for rummaging and discovering amazing vintage finds including homewares, furniture, lighting, clothing and books. Waking Grey Vintage, online + at UK festivals, best for minimalist vintage clothing. Everything But The Dog, online + physical store in Hommerton, London, best for iconic vintage furniture. Vintage Honey Interiors, online + Alty Market, best for industrial salvage + up-cycled vintage. Image: Studio Pottery Mug sourced from Gibson + Gibson styled with a mid-century inspired Eleanor Pritchard wool blanket. My Warehouse Home - Best for inspiration and advice on how to achieve industrial vintage style in the home. My Scandinavian Home - An award-winning interior blogger Nikki Brantmark moved from London to Swede 10 years ago. Her blog is full of beautifully curated rooms that expertly blend Scandinavian style with modern vintage. Flea Markets Insiders - A great source for flea markets all around the world ! The perfect guide if you're travelling to another country and want to check out their local vintage scene. Modernist Estates - Featuring the best of the Brutalist bricks and mortar for sale in the UK ! Image: Vintage G-Plan Dresser sourced from Ebay. Image: Seventies cane magazine rack sourced from Pear Mill. Image: Vintage ceramics (white jug with handles, spotty vase) both sourced from Gibson + Gibson. Image: Vintage stoneware teapot + studio pottery mug both Gibson + Gibson. Image: Vintage bottle green enamel dish sourced from a flea market in Falmouth. Midcentury toast rack sourced from a vintage store in Penzance. Image: Fifties G-Plan Teak Side Unit and Dieter Rams for Braun Stereo + Record Player both sourced from Ebay. Image: Vintage Ercol 'Plank' Dinner Table and Windsor Quaker Chairs sourced from Etsy. Image: Vintage Ercol Windsor Chair + Sofa sourced from Failsworth Mill, restored by Reloved Upholstery.